Kent's "Hooligan Libertarian" Blog: The State- BAD "government"
"Government" has two aspects, one positive, the other negative. The positive aspect is protection of the individual, through protection of their rights. The negative aspect is the State. Unfortunately, most people mistake the State, externally imposed government, for that which protects the individual, but it isn't. 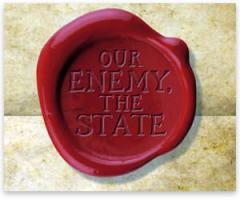 The State is completely negative and destructive; harmful and enslaving. The government which protects the individual is totally separate from the State. Pretty much the opposite of the State. It is self-government; self-control. It is living within what you have a right to do. It is standing up for individual rights. It is living up to your responsibility to not violate others-- because that is your greatest responsibility. The State is a rejection of that grave responsibility. When most people speak of "government", they mean The State. It's why that's how I usually use the word, too, when I am trying to communicate with them. Otherwise they simply don't understand and believe you are speaking of Texas or Colorado. But I do understand the difference. It is systematic violence. That's it. Any protection is done at the expense of some other right. It cannot exist without violating. If it functions without coercion/force, it no longer qualifies as government and must function as a service. It is either government/statism, or it's not. If not, then it needs permission and functions as a service. If you choose to not archate, you are self governed. If a group makes up "laws" telling you it is forbidden to archate or to do a bunch of other things which aren't archation, then you have a State. But, yes, most people use the word "government" to mean the governing is being imposed on you (a State). Oh, and the group will list the punishments you are subject to.